To keep our school grounds tidy. To make sure lights are switched off when they are not being used to help save electricity. To work with other classes in our school to teach them about being ECO friendly. 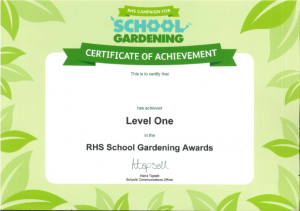 We are also working towards achieving Level 2 of the RHS School Gardening Award following the achievement of Level 1. As a team, we are really interested in helping wildlife, growing, plants, recycling, looking after our environment and sharing our love of nature with the younger children.